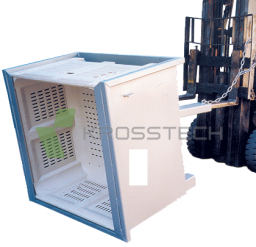 The Krosstech mega pallet bins are designed for heavy duty part storage or general bulk storage. The mega pallet bins can be used for fruit and vegetable storage and transportation, however is also suitable for liquid and bulk materials handling. Krosstech pallet bins can be used in a range of different industries. 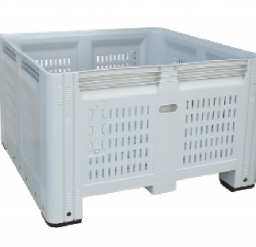 You have the option of a solid or vented mega pallet bin, depending on the contents you’re wanting to store. 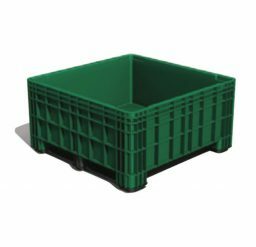 The pallet bins are made with a high density polyethylene and have a capacity of 750L. 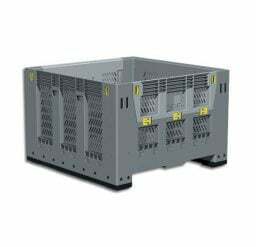 Comfortable handholds are built in for easy lifting and handling of bins. We also offer a mega bin forklift tipping attachment to safely and efficiently transfer produce. 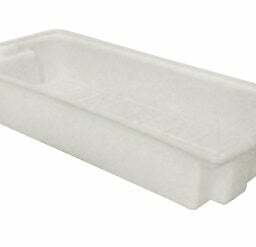 The moulded interior makes the pallet bins easy to clean which can reduce cleaning costs for your business. You have the option of adding a Mega-bin Lid Code which makes each pallet bin easy to identify and track when in batch lots. 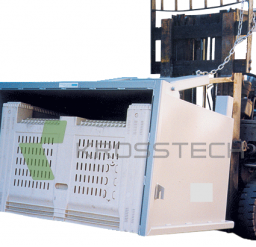 Krosstech pallet bins are heavy-duty, reliable and durable. The mega pallet bin proves excellent performance in freezers, adding value and long-term benefit for investment for your workplace. 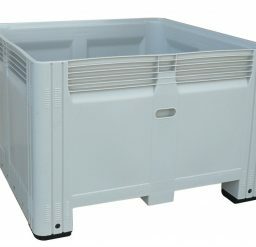 Whether you’re wanting to use the mega pallet bins for handling food processing, bulk parts storage, hazardous goods, waste management, raw material transfer, fruit & vegetable transportation, plastics processing or any other materials, Krosstech can provide your workplace with a long lasting, durable pallet bin to suit your needs. They’re easy to nest and stack, with lids also available if needed. The quality of our pallet bins is guaranteed to serve you for years to come. Not only do our trolleys help transport items faster, they are also easy to assemble and clean. This equipment will help you accomplish tasks faster and increase productivity in the workplace. Here at Krosstech, we always think about the security of your items as if they are also our own. This is why we ensure that the pallet bins we provide are of the highest quality.